We’ve been waiting quite a while to see what Apple would replace the iBook with, and the rumored 13.3″ widescreen MacBook is now a reality. The biggest surprise is that Apple is replacing both the iBook line and the 12″ PowerBook with the 13″ MacBook, greatly simplifying their line of notebook computers. Built around Intel’s Core Duo CPU, Apple claims up to 5x the performance of the iBook. New to the entry level are built-in iSight, a glossy screen, and support for extended desktop mode, something never officially supported with iBooks. The top-end MacBook comes in a gorgeous black finish. The MacBook uses the same MagSafe power connector as the MacBook Pro line. MagSafe is designed to detach itself when someone trips over the cord, preventing your MacBook from crashing to the floor. One unexpected new feature is auto-unmute, for lack of a better name. If your MacBook’s volume is set on mute and you plug in headphones, it immediately turns on the volume – and it mutes as soon as you unplug the headphones. Clever. From the very beginning, there was some controversy over the MacBook’s glossy, reflective screen and unusual keyboard, which looked like a throwback to the era of “chiclet” keyboards but ended up becoming the norm. 1.83 GHz Intel Core Duo, Combo drive, 60 GB 5400 rpm hard drive, 512 MB RAM, Intel 950 graphics, built-in iSight, and a 1280 x 800 display for US$1,099 in white. Build-to-order options include 1 GB and 2 GB RAM configurations and larger hard drives. Just like the other Macintel models, the MacBook comes with Front Row and a remote control. With a 2 GB memory ceiling, it wouldn’t run Lion decently anyhow, and the first generation Intel Macs run Snow Leopard very nicely with 2 GB of RAM. If your Mid 2006 MacBook has 512 MB, upgrade immediately. You really need 1 GB to get okay performance from OS X 10.4 Tiger or 10.5 Leopard. As of August 2014, you can get 2 GB for $23 from Other World Computing, and with Snow Leopard just $20 from Apple, take the Mid 2006 MacBook as far as it will go with RAM and operating system. Early MacBooks used decent 5400 rpm hard drives, but newer drives will provide much snappier performance. 7200 rpm notebook drives start at $59 these days (August 2014), and for a serious speed boost, Other World Computing offers a 44 GB solid state drive (SSD) for just $50, although you’ll probably want something with more capacity. introduced 2006.05.16 at US$1,099 (1.83 GHz white 512/60), US$1,299 (2.0 GHz white 512/60) and US$1,499 (2.0 GHz black 512/80). 1 GB/80 white version at US$1,449 added 2006.07, replaced by Core 2 model 2006.10.08. The MacBook value equation: Incredible value, Dan Knight, Mac Musings, 2006.05.16. With a widescreen display, dual-core CPU, fast bus, and $1,099 base price, the MacBook isn’t just a great value – it could gut sales of the 15″ MacBook Pro. Don’t ignore battery recall, fuel cells to replace lithion?, flash MacBooks, tablet Mac, and more, The ‘Book Review, 2006.10.06. Also how laptops are replacing pen and paper in the classroom, Core 2 no big deal for notebooks, black MacBook Apple’s best ‘Book yet, bargain ‘Books from $119 to $2,399, and more. AirPort update improves security, Britannica incompatible with Macintel, Cool Feet for your ‘Book, and more, The ‘Book Review, 2006.09.29. Also a nasty chemical inside the MacBook, VGA and DVI on MacBook not supported by Boot Camp, fastest SuperDrive for ‘Books, bargain ‘Books from $249 to $2,399, and more. MacBook random shutdown, inside a notebook battery, Portectorz for MacBook, EVDO support, and more, The ‘Book Review, 2006.09.08. Also MacBook Q&A, Logitech’s revolutionary laptop mouse, Danger Mouse in black, bargain ‘Books from $119 to $1,899, and more. MacBook repair saga: Botched and botched again, but third time’s the charm, Andrew J Fishkin, The Mobile Mac, 2006.08.07. After 2 weeks at Apple, the MacBook came back running hotter than before. The first replacement MacBook ran cooler but had its own issues. The third MacBook, however, fulfills all expectations. MacBook pleases, but two weeks for repair is excessive, Andrew J Fishkin, The Mobile Mac, 2006.07.25. The 13″ MacBook has replaced 12″ and 15″ PowerBooks and makes a very nice Windows gaming machine, but nobody should have to wait 14 days for Apple to fix their new computer. MacBook heat, random shut down, MagSafe mod for car/plane use, extend your ‘Book’s battery life, and more, The ‘Book Review, 2006.07.21. Also frying an egg on a MacBook, stupid MacBook tricks, flash drives to dominate notebook market by 2013, Daystar’s 1.92 GHz PowerBook G4 upgrade, cooling stands, bargain ‘Books from $259 to $2,829, and more. Apple fixes MacBook discoloration, ‘Book sales see 39% growth, keeping your ‘Book cool, and more, The ‘Book Review, 2006.07.07. Also MacBook a sales success, another dead Mac, 10.4.7 updates adds two-finger right click, MacBook Pro biometrics, bargain ‘Books from $139 to $1,650, and more. Blocked MacBook vent, MacBook benchmarked, how to upgrade RAM and replace your hard drive, and more, The ‘Book Review, 2006.06.01. 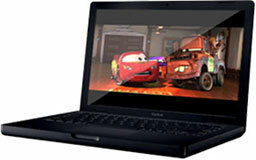 Also the price of beauty, MacBook anticipates features of future MacBook Pro models, and several MacBook reviews. Hands-on with the MacBook: first impressions, Dan Moren, MacUser.com, 2006.05.16. Mixed thoughts about the glossy screen, and the keyboard is unlike any previously found on any ‘Book.